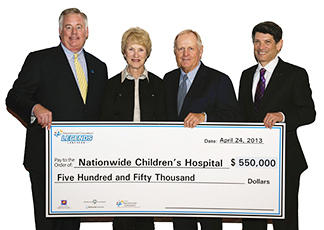 Presentech can print a big check for your presentation that is the center of attention. Our big checks are printed direct to board for one time use or if you prefer, we can add a dry erase laminate so you may use it over and over. Just wipe clean and reuse again! You may provide a custom design, or we can provide a template that is ready for you to customize with your logo and text. If you aren't able or don't care to handle the design, our graphic artists will add your info for a nominal charge. If you don't see what you're looking for, we'll email you a quote. Please request a custom quote.